Today I'd like to show off another new feature coming to the WPF and Silverlight .NET Languages Add-on: Visual Basic text formatting! 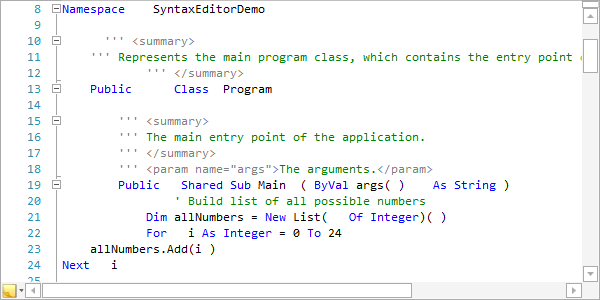 As mentioned in our previous post, a similar feature is being added for the C# language. Text formatters beautify code, making it more readable by adjusting whitespace. As described in a previous post, the best part about the text formatting feature is that SyntaxEditor only adjusts ranges it needs to. It doesn't do a mass replace of the whole document. For instance on line 23, it tweaks the leading whitespace on the line and removes the space before the end parenthesis, but doesn't touch the rest of the line. All of the various text change operations involved in the formatting are merged into a single atomic text change that is added as a single undo stack item. This makes it easy for the end user to quickly undo any formatting changes that were made. 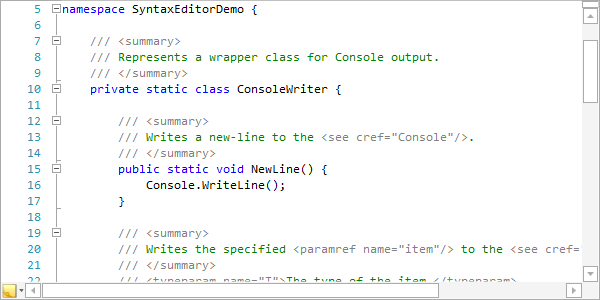 These features will be in the 2013.1 versions of the WPF and Silverlight SyntaxEditor .NET Languages Add-on. 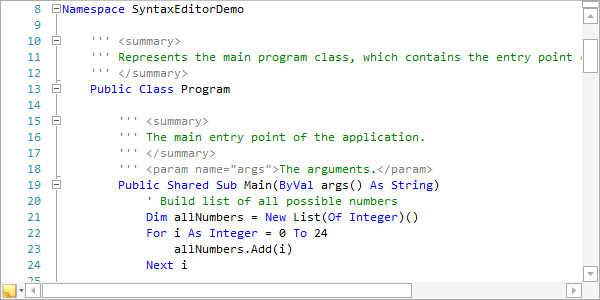 We just published v1.5 of Code Writer, our free text/code editor app, to the Windows Store. This version adds touch-based text selection, new and improved file types, and more. 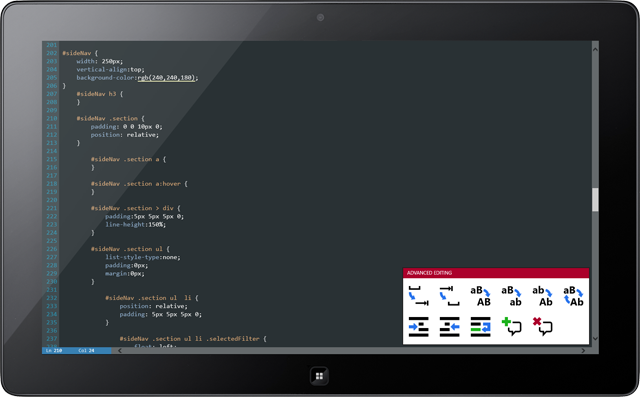 Past versions of Code Writer had support for the soft keyboard and touch-based scrolling in the editor. But the editor was still missing the last couple pieces of desired touch functionality: text selection and context menus. Version 1.5 adds complete touch-based text selection features to Code Writer, allowing you to fully edit files without a hardware keyboard! Tap on a character to display the selection gripper. Tap and drag the gripper to extend the text selection in either direction. Once more than one character is selected, two selection grippers will be visible, one at the start of the selection and one at the end. Both can be manipulated to alter the selection. You also can tap and hold, tap the selection, or tap a selection gripper to show a context menu with common editing features like Cut, Copy, Paste, Undo, etc. The context menu is intelligent and only shows applicable commands. Version 1.5 adds live tile badge notifications to the Windows start screen. The notification is the number on the lower right part of the tile. It tells you the number of unsaved documents that are currently open, helping you know when there is work left to be done. Several new requested file types have been added in this version: ASP, ASP.NET, and INI. We've improved the PHP file type to support full syntax highlighting of HTML, CSS, and other script blocks. PHP also now supports color previews. Numerous other minor enhancements have been made to aid in improving startup time and reducing memory usage. In addition, the app now recovers better if an error occurs during startup. With the addition of full touch support for text editing, this new version makes Code Writer the go-to solution for any kind of mobile text editing need. 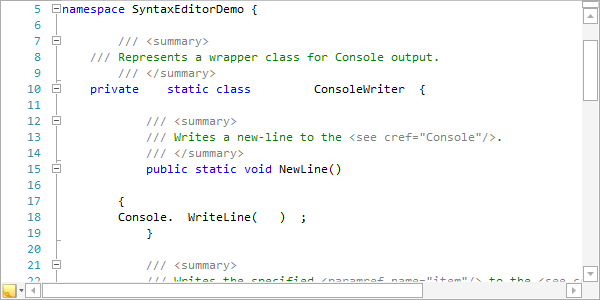 Today I'd like to show off a new feature coming to the WPF and Silverlight .NET Languages Add-on: C# text formatting! Text formatters beautify code, making it more readable by adjusting whitespace. That's a lot more readable! The text formatter also has an option for whether open curly braces appear on the same or next line. The best part about this feature is that SyntaxEditor only adjusts ranges it needs to. It doesn't do a mass replace of the whole document. For instance on line 7, it does a tweak of the leading whitespace on the line but doesn't touch the rest of the line. We just published new maintenance release of both the WPF and Silverlight controls. These new builds fix a SyntaxEditor problem that we introduced in the previous maintenance release, and also have several other minor SyntaxEditor tweaks and fixes in them. We recommend that you get these latest v2012.2 maintenance releases. A new theme has been added the is inspired by the classic Obsidian theme. An option has been added to the Editor settings flyout, allowing you to specify a desired file encoding to use when saving files. By default it will use logic that attempts to match the file's existing Unicode format (if present), and fall back to saving in UTF-8. Middle mouse button clicks on the document tabs now close the document. Color previews now work for rgb() and rgba() syntax. Use trackpads and advanced mice to horizontally scroll documents. A new duplicate line operation can be executed from the Advanced Editing Operations gallery or via Ctrl+D. A new Editor settings flyout option allows the soft keyboard to be disabled from showing when the editor has focus. This is ideal for touch-based reviewing of code. New chord hotkeys have been added to some of the Advanced Editing Operations gallery items that didn't already have hotkeys. For instance, pressing Ctrl+E then C will execute the comment selection operation. Now file type icons all have high-resolution support and have a modern look with the Code Writer logo, and the same color associated with each file type. 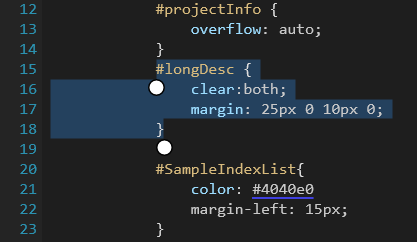 Current line highlight now remains visible when focus is moved to other UI elements, such as the find/replace flyout, etc. This new version adds some very nice enhancements to the app. Go to the Windows Store to download it, and help us by tweeting about the app!